Lean Six Sigma quality-improvement methods focus on reducing defects, streamlining processes, and improving product quality. This program focuses on the main steps in the Lean Six Sigma approach. Green Belt training provides individuals with a methodology and tools to deliver successful projects as a Lean and Six Sigma project team member. Teams will be established during the course and are expected to identify a project they can work on. Throughout the training, in teams of three to four, they will have the opportunity to apply concepts and techniques. This training will allow employees to be valuable assets to drive the organization’s goals and objectives in the future. Understand and apply the Lean and DMAIC models as a framework to drive process improvement activities. Learn and apply skills in process management, Lean, change management, and basic statistical analysis to business issues. Apply basic statistical analysis to determine the relationship between key inputs and outputs. Transition projects from phase to phase using DMAIC. Define both bottom-line and soft cost savings from improvements. 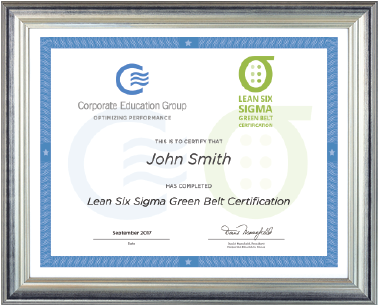 The Lean Six Sigma Green Belt Certification Program consists of eight days of classroom training — four 2-day sessions over the course of 8 weeks. The program is also available in a virtual, Instructor-led format. To achieve the Green Belt Certification, each participant must successfully complete the course which includes attending all sessions, completing assignments, passing a final exam and completing a relevant team project within 12 months of the class end date. Participants who opt for the CEG/Duke University Management Training Lean Six Sigma Green Belt Certification Program are required to pass a 20-question exam at the end of each 2-day session to earn a co-branded certificate of completion jointly issued from CEG and Duke University.